I’m so excited! I have been waiting a LONG time (even in knitting time) for this yarn to come in. I am in love with all things Madelinetosh andp it seems like the feeling has been sweeping the knitting world. What I love the most about this yarn are the colourways. Some are a very subtle kettle dye, while others are a little bolder, all have a dimension that is to die for! I’ve been particularly smitten with kettle dyes myself. Instead of a flat colour there is just so much more to them. 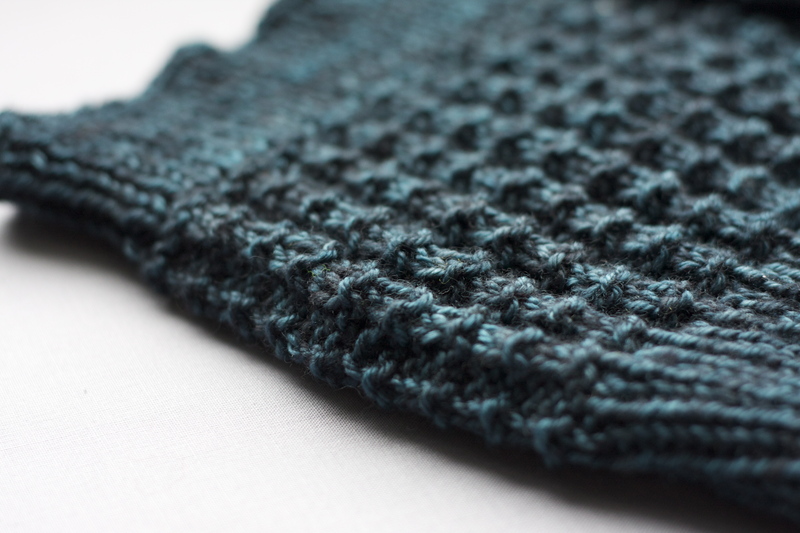 It’s really adds something to even a simple stockinette piece. A kettle dye can also be preferable to a variegated yarn when it comes to lacy or cabled patterns. The pattern still comes through but the piece is more interesting than it might be in a flat colour. We have 3 different kinds of Tosh in: Tosh DK, Tosh Merino DK, and Pure Silk Lace. You might be wondering about the 2 DK weights (DK, by the way, stands for Double Knitting, and knits up around 22 stitches per 4 inches). The Tosh DK is a plied superwash yarn. Perfect for garments you don’t want to handwash (I feel some baby garments coming on) but still a hand dye, what a great combination. The Tosh Merino DK is a single ply yarn, this means it has little spin to it so it’s super soft but keep it far away from hot soapy water (unless you are felting but that’s a special circumstance). I like the Merino DK for a scarf or hat, something that doesn’t see a lot of friction and needs to be buttery soft. The DK is great for a sweater or mittens, something that needs a heartier yarn. The lace, of course, is perfect for any piece of summery lace and the shine combined with the stunning colourways is stunning. At a very generous 1000 yards per skein you could knit 2 smaller shawls or 1 large one with just one skein, how fabulous! I’m starting to think my Rock Island shawl should be a Madelintosh one….. This entry was posted on Thursday, May 5th, 2011 at 10:22 pm	and is filed under Uncategorized. You can follow any responses to this entry through the RSS 2.0 feed. Both comments and pings are currently closed.